Positive – Energy input is greater than energy output, body weight increases – excess energy is stored in adipose tissue as fat. Negative – Energy input is less than energy output, body weight decreases – energy stores (adipose/muscle tissue) converted into energy to meet demands. Neutral – Energy input is equal to energy output, body weight is unchanged. Hibernation – Despite a decrease in metabolic rate (energy output), the animal is still not receiving any energy input as it i s not consuming food. The animal must therefore breakdown stores of energy from its own body reserves such as adipose tissue. The animal usually prepares for this state of negative energy balance by increasing energy input before hibernation to build up body reserves. Pregnancy/ Lactation – Increased energy output required for producing milk or the development of offspring is usually met by the mother, who greatly increases energy input (food intake). Yet it is very easy to not meet these energy demands, which can result in a loss of weight in the mother. For example in sows the energy requirements to produce enough milk for a litter of 10 can be up to four times that of a non-pregnant sow, if the mother does not consume enough food (or is not given enough food) she will begin to use her own stores of energy and lose weight. 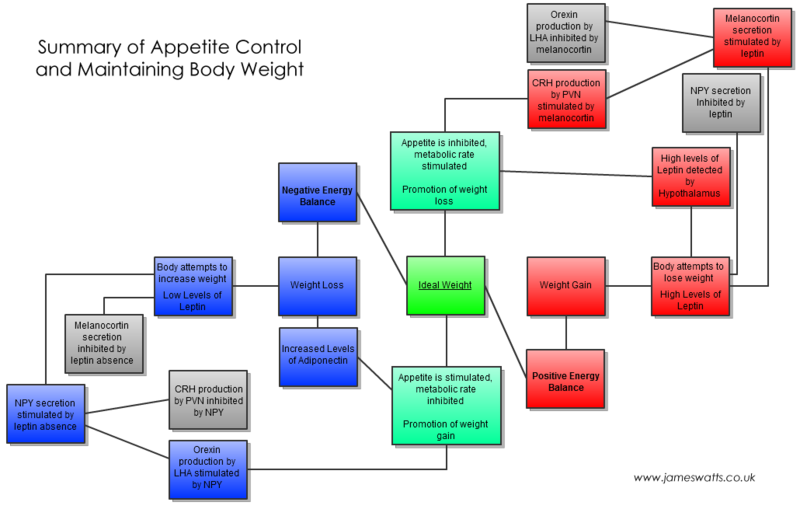 The body is believed to have a predefined, set weight controlled by precise regulation of appetite. This can be observed in most animals who maintain a near constant weight even when food resources are plentiful. It is believed that the hypothalamus is responsible for this precise regulation of appetite. The hypothalamus is an important region of the brain which controls homeostasis, aids in the control of the autonomic nervous system and more importantly for this situation, acts as a link between the endocrine and nervous system. The hypothalamus is able to detect hormones in the blood secreted by peripheral fat, the liver and the gut all of which reveal details about the current energy status of the body (positive, negative or neutral). It also receives signals from other parts of the brain, such as the brainstem (connecting the brain to the spinal cord and consisting of the midbrain, medulla oblongata and the pons). The brainstem transfers important information from the peripheral nervous system to the mid and forebrain. In terms of appetite control, the brainstem forms direct neuronal connections with the gut allowing it to regulate mechanical processes involved with appetite/ food consumption such as chewing and swallowing (The volume of consumption is controlled by the hypothalamus). Areas of the brain involved in sleep arousal and therefore being awake and reactive to stimuli are also important as they control food-seeking behaviour. In simple terms, the sections of the hypothalamus responsible for appetite can be split into two – an ‘appetite centre’ and a ‘satiety centre’ (satiety meaning the feeling of being ‘full’). The appetite centre is responsible for causing the feeling of hunger, therefore initiating searching behaviour for food. The satiety centre therefore, causing the opposite and giving the feeling of ‘being full’ ceasing the desire to consume more food. Test have been conducted on these ‘centres’ and the findings prove the theory – animals with removed/ damaged appetite centres no longer appear to feel hunger, refusing to eat and becoming anorexic. Animals with a removed/ damaged satiety centre, as expected no longer appear to feel ‘full’ continuing to eat and causing great increases in body weight. There are two main theories behind appetite regulation – the ‘glucostat’ theory and the ‘lipostat’ theory. Both however show the hypothalamus in communication with the peripheral systems. The glucostat theory regulates short-term control over appetite. The glucostat theory is believed to be responsible for the frequency and size of meals, preventing overeating during meals. During a meal, glucose metabolism is monitored by specialised receptor cells in the hypothalamus, when glucose levels rise to a certain threshold, neuronal activity within the satiety centre begins to increase. This removes the feeling of hunger and the animal finishes the meal. When glucose levels fall below the threshold, neuronal activity in the appetite centre will increase and the animal will go in search of its next meal. As you can see, this is a short-term control over appetite. Interestingly, in ruminants the intravenous infusion of glucose (to prevent the glucose being fermented in the forestomach by symbiotic bacteria) does not affect satiety centre neuronal activity i.e. does not affect the ruminant’s appetite, as it would in other animals. Yet the infusion of volatile fatty acids (the product of fermentation by bacteria in the forestomach and the main source of energy for the ruminant) does affect satiety centre neuronal activity. This suggests that changes in the amino acid concentration of blood have the same effect on food intake as glucose alterations in other animals. Unlike the glucostat theory, it is thought that the lipostat theory controls long-term appetite – the cumulative effect over time of many meals. This therefore makes it responsible for the control of body weight. As fat deposits accumulate, satiety signals are sent to the hypothalamus in response in an attempt to suppress the feeling of hunger and maintain a constant body weight. Leptin and other hormones act as satiety signals and are released from fat cells in proportion to the size of the cells. This means that as an animal becomes fatter, the amount of leptin secreted increases. As leptin acts as a satiety signal, the increased amounts are detected by the hypothalamus which in turns increases satiety neuronal activity. The activity of these neurons decreases the feeling of hunger so the animal should consume less, remove the extra weight and return to its set weight. Leptin is the main hormone associated with adipose control of appetite, seen in many animals (not just mammals) it is released in greater quantities from fatter animals in an attempt to reduce appetite. Leptin binds to receptors in the arcuate nucleus (found in the hypothalamus). The binding suppresses appetite and stimulates the metabolic rate which act together to produce weight loss. In animals which hibernate, these signals are ignored during the autumn to allow the animal to consume enough food to build up energy stores which will last over winter. Adiponectin is secreted in greater amounts by the fat of leaner animals than obese animals. It is believed to have opposing functions of leptin i.e. stimulate hunger when released in greater quantities. The many chemical messengers which control food intake are stimulated by lectin in some manner. The chemical messengers that increase food consumption also promote weight gain by stimulating sympathetic nervous system activity; those which decrease food consumption also promote weight loss by inhibiting sympathetic nervous system activity. The arcuate nucleus contains two major subsets of neurons which are regulated by leptin in an opposing manner. One releases neuropeptide Y (NPY) and the other, a family of hormones known as the melanocortins. NPY is a powerful appetite stimulator, therefore leptin is able to suppress food intake by inhibiting the secretion of the hunger inducing NPY from the arcuate nucleus. The opposite is also true, when leptin levels are low (such as after weight loss) NPY is no longer inhibited and the hunger inducing neuropeptide results in increased levels of food consumption. The melanocortins are able to decrease food intake. When fat stores rise and leptin is released in higher quantities, arcuate neurons which secrete these melanocortins are stimulated – decreasing food intake and weight. This occurs simultaneously with the inhibition of arcuate neurons which produce NPY by leptin. Two other hypothalamic regions involved in appetite project from the arcuate neurons. These are the paraventricular nucleus (PVN) and the lateral hypothalamic area (LHA). The LHA produces orexins which are powerful neuropeptide stimulators of feeding; their release is stimulated by NPY and inhibited by melanocortins signals. The PVN releases corticotrophin-releasing hormone (CRH) which is an appetite suppressor, its release is stimulated by melanocortins but inhibited by NPY. The nucleus of the solitary tract in the brainstem integrates sensory messages from the digestive tract, via the vagus nerve, with hypothalamic inputs to signal to the animal to terminate a meal. Also stretch stimulation of the stomach (gastric stretch receptors) can inhibit hunger, whilst conversely when not stretched, the receptors may stimulate hunger. Cholecystokinin (CCK) – Released from the duodenum in response to the presence of nutrients in the small intestine. These chemicals can allow the animal to feel full, before a meal has been fully digested in order to prevent overeating. In mammals glucose levels alter rapidly during feeding. High blood-glucose levels indicate satiety to the body, whilst low levels indicate hunger. Insulin is released from the pancreas in response to a rise in blood glucose levels, causing uptake of glucose into tissue. Insulin is therefore acts as a satiety signal. Palatability – If a food substance tastes good, the organism will derive pleasure from eating it and hence reinforce this behaviour. This could result in overeating.